Two Phnom Penh Crown players have made it into Lee Tae-Hoon's Cambodian national squad for the Mekong Region BIDC Cup (aka MRYUIFTBIDC Cup) that kicks-off next Saturday, 8 October. In Sok Sovan (pictured), the South Korean coach has decided to select one of the C-League champions most promising youngsters, who got a few chances in the team at the end of the season and in the AFC President's Cup. The 19-year old is certainly one for the future and has impressed club coach David Booth over the last few weeks. 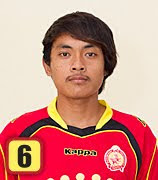 Sovan joined the Crown club as a 14-year-old in 2006 and has played for Cambodia at U-16 age level. He was loaned out to Kompong Cham side Neak Khiev at the start of the season, as they made an unsuccessful attempt to gain promotion into the C-league last term. The other Crown player to make the national squad for the U-21 BIDC tournament is striker Sok Pheng, another who impressed his Crown coach when he was given his chance just after the half-way mark in the C-League campaign. With 7 goals under his belt, he more than repaid the faith shown in him by David Booth and looks set for a good future with the league champions. 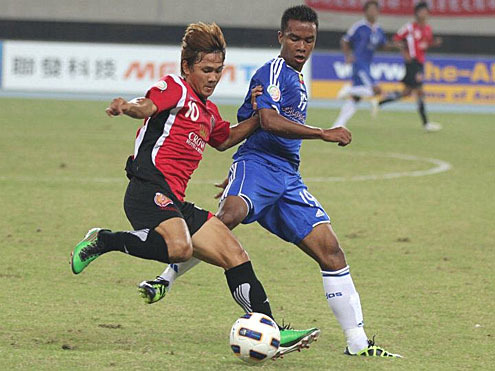 Sok Pheng was in the full national team squad earlier in the year for the matches against Macau and the Maldives. The striker, who turned 21 today, previously played for the Navy, the Army and Khemara Keila before joining Crown in 2010. A few official AFC photographs taken at the recent AFC President's Cup final stages in Taiwan, all showing our very own number 10, Phnom Penh Crown's Kouch Sokumpheak, in action. Before this season's competition, Sokumpheak appeared twice in previous AFC President's Cup competitions, both for Khemara Keila, back in 2006 and 2007, scoring 4 goals in 7 matches.